OK, call me crazy but I love this little camera. I own one of these and a Kodak Pixpro. I can't say that I like one better than the other, I love them both. But this instax mini is great for on the spot pictures. I love that you can also buy different types of paper to go in it. The paper is kind of $$ if you use it all the time like I do. I use it mainly to take photos of my son for his baby book. The size and quality of the photos are perfect for the baby book. In my own opinion this is amazing camera and a really good price. And here is the info it gives to know what settings to use for the best photos. If you are new to this to the Instax 7 camera it can be a little confusing on how to get started. The batteries go on the right and the back is where you load you film. Make sure you're putting the film in with the writing on top, facing you. It can be a little tricky at first. After inserting the batteries and film, all you need to do know is turn it on. Now click on your desired settings and Point and shoot. Welcome to your new Instax camera 7. @alyssa_phillips thank you so much. I had a lot of fun doing this review. My advice is to buy the whole bundle off of Amazon, way cheaper. I paid $60 for mine at Walmart and if I would have waited I could have paid about $40 more and got a case and extra film plus different colors that fit over your lenses. @kyra_brown oh cool, yes, I see the one on amazon right now with the selfie mirror for 58. @melodie_couture thank you Melodie. It was a very fun review to do. @alyssa_phillips I have never seen the selfies mirror. I will have to check it out. Thanks for that info. This seems lije a great instant camera. Great review. This sounds like a dream to have! 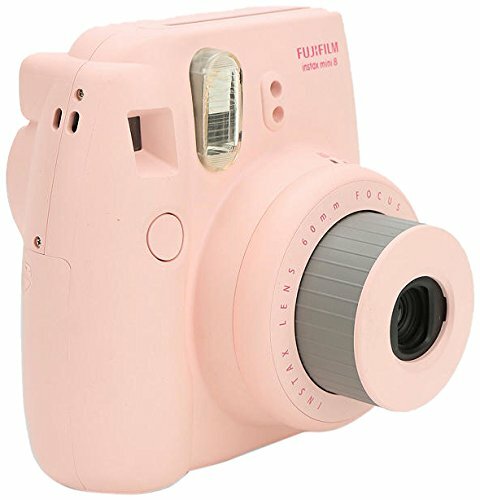 I think I would like this and it sure comes a long way from the old Polaroid cameras. @joni_hoffman I agree, these have so many options. You can purchase many different things to change the color of the photos. Also buy film packs in B&W. Way more cooler than a regular Polaroid.